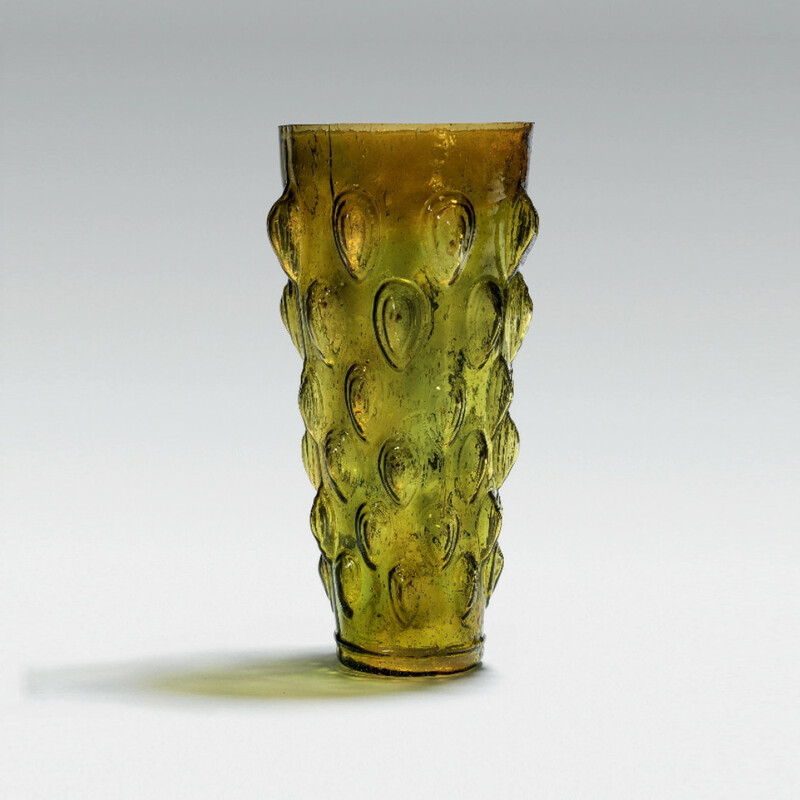 With its rich, translucent yellow-green colour, and exquisite decorative motif, this Roman glass beaker is a truly fine example of glass working from antiquity, exemplifying the Roman mastery of the craft. Six rows of eight graduated triple-tiered almond-shaped bosses in relief span the outside the vessel, with two concentric wheel-incised circles and a horizontal rib forming the base. Made using a mould blowing technique, the details were created using specially shaped pre-made moulds. The molten glass, made from a sand composite, would have been poured in to moulds and fused in to these intricate shapes, then left to cool before being removed and polished. The technical difficulty of this beaker conveys its great expense. When filled with wine, the colour, which is unusual for Roman glass and probably made by adding lead, would transform from a vibrant olive-green, to a deep maroon, adding an element of theatre to its practical use. The maker of this vessel was no doubt highly skilled at his craft, and had a complex understanding of symmetry and proportions when creating visually stunning objects. It was during the 1st century AD., under Augustus’ stabilisation of the State, when glass making production excelled. New Roman furnace innovations allowed stunning the likes of which had never been seen before, to be made. Having been excavated in industrial, funerary, religious and domestic contexts, in colours ranging from blue, red green and clear, and in a variety of shapes adorned with figural, abstract and floral motifs and covered in writing, it is clear that glass’s popularity exploded as a both a functional material and decorative craft. Roman glass was also widely exported, as far as Afghanistan, India and even China. The monumental size of this glass represents a serious undertaking by the artisan - creating something of this scale from such fragile material and with limited technologies is a defiant feat. This example is among the largest of its type, making it a rare survivor and easily of museum quality. It would have no doubt graced a fine Roman dining table inside a superb villa during antiquity. A similar example of this type of glass beaker with almond droplets exists in the British Museum in London. Lacking the depth and clarity of colour, refinement of execution and monumental size of this example, it highlights the range of quality such glassware could come in, and illustrates the scarcity and value of this example. The similarity in design between the two suggests this was a particular type of beaker produced throughout the empire that would have been a familiar sight in the households of the elite. This glass vessel was once in the famous Benzian Collection of Ancient and Islamic Glass – an outstanding museum quality collection built by Mr Hans Benzian (1917-1998) and Mrs Gertie Benzian (1921-2007), which was auctioned off in a dedicated sale by Sotheby’s in 1994 that fetched over $2 million. The Swedish couple who lived near Lucerne in Switzerland purchased many important pieces of ancient glass throughout the second half of the 20th century, especially during their time living in Manhattan after the Second World War. They continued adding to their collection until the end of the 1980’s, when they lent a substantial portion of it to the exhibition 3000 Jahre Glaskunst at the Kunstmuseum, Lucerne in 1981. The 1994 sale was billed as most important auction of ancient glass in a decade by Sotheby’s, and spanned from c.1300 B.C. Mycenaean glass to 1100 A.D. Islamic glass across 200 pieces. After the sale, many works ended up in important museum collections, such as a fine 1st century AD Roman beaker in the J. Paul Getty Museum in Los Angeles. Prior to this, the glass beaker was also in the collection of James Bomford (1896-1979), a distinguished antiquities collector who exhibited much of his fine collection at the Ashmolean Museum in Oxford in 1971, later selling his glass collection to Bristol City Museum and Art Gallery. Consisting of over 200 pieces, the glass collection today remains maintained by the Bomford Trust, which still supplements it with new acquisitions. He generously supported the two museums throughout his life and is regarded as greatly shaping the collections of both institutions. Amassed with the help of wife during the 1960’s and 1970’s, the Bomford glass collection consisted of mostly Roman pieces originating from Italy, Egypt, The Levant and Asia Minor, tracing the origins of glass production throughout the Classical world. James Bomford’s generous legacy is still visible today – aside from the Bristol glass collection, many important pieces from the Bomford antiquities collection still remain in the permanent collections of the Ashmolean Museum as well as the British Museum in London, where he donated a number of artefacts between 1961 and 1978. During his lifetime he also collected contemporary art, at one point owning 12 Francis Bacon versions of The Screaming Pope, and was an avid yacht racer and Bentley tourer. The Bomford Collection has been much written about by the great art historian P.R.S. Moorey, who was Keeper of Antiquities for the Ashmolean Museum, and a long time friend of James Bomford. M.E. Stern; Roman mold-blown Glass: The First through Sixth Centuries, Exh. Cat., The Toledo Museum of Art, Toledo OH., 1995, p.22. S.J. Fleming; Roman Glass: Reflections of Everyday Life, UPenn Museum of Archaeology, 1997, p.7. Dark green conical shaped mould blown beaker, decorated with five rows of almond-shaped bosses and a wheel-incised band below the rim, British Museum, London. Roman, 1-2nd century AD., excavated Cyzicus, Turkey, H: 13.2 cm. 1892/0613.50. H. W. Catling, and P. R. Moorey; Ancient Glass, Jewellery and Terracottas from the Collection of Mr and Mrs James Bomford, Ashmolean Museum, 1971. James Bomford (1896–1979) Collection, assembled between 1960-1978. Acquired by Hans Benzian (1917-1998) at Sotheby’s, London, 14 July 1986. In the famous Benzian Collection of Ancient and Islamic Glass between 1986-1994. Acquired at “The Benzian Collection of Ancient and Islamic Glass”, Sotheby’s, London, 7 July 1994 auction. Ancient Glass: The Bomford Collection of Pre-Roman & Roman Glass, City of Bristol Museum and Art Gallery, 1976. The Benzian Collection of Ancient and Islamic Glass, Sotheby’s, London, 7 July 1994, lot 9. Antiquities sale, Sotheby’s, London, 14 July 1986, lot 64. “A Magnificent Collection of Ancient Glass”, 2017.